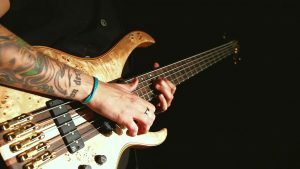 Lucio Manca is an internationally renowned Bass Player, Composer, Writer, Solo Artist and Session Musician. From a young age he showed a great passion for music and love for the electric bass guitar studying and improving his style and knowledge of the instrument. During the early years he helped to developed several music projects that ranged from punk, rock, crossover to heavy metal. Later he found his ideal musical dimension with the band ‘Bremys’ inspired by the exceptional styles of bands like Tool, A Perfect Circle and Katatonia. He recorded two albums ‘Bremys’ (2008) ‘Resurgo’ (2009) the official music video “Quel che non c’é”. and had the honour to share the stage with internationally renowned artists on tour through Italy at that time.